Samuel Johnson was said to have remarked that ‘every man thinks meanly of himself for not having been a soldier’: visit the ‘Nelson, Navy, Nation’ exhibition at the Greenwich Maritime Museum and, even if Johnson’s quip means nothing to you, it is nevertheless hard not to be moved with the bravery and sacrifice of the men of Britain’s Royal Navy during the nineteenth century. 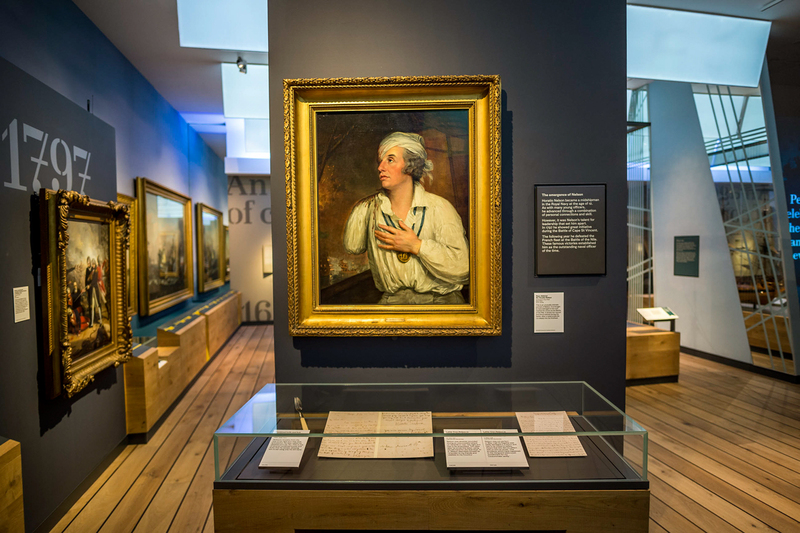 And it is here, in Greenwich’s Maritime Museum, that you’ll find more and learn more about Britain’s greatest ever seafaring hero, Lord Horatio Nelson, than anywhere else. 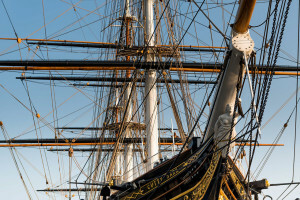 Nelson was of course the man who defeated Napoleon at the Battle of Trafalgar and changed history forever. But what’s learned in the history books comes staggeringly to life at the museum and seeing exhibited the Vice-Admiral’s coat that bears a fatal bullet hole from a French musket inflicted hours before victory at Trafalgar is moving in a way that no written article or television program could ever possibly be. And as famous last words go, ‘Kiss me Hardy’ has gained a certain traction, but that’s not the whole story as you’ll learn, for after that request, as Thomas Hardy, Nelson’s flag captain, relayed news to the Vice-Admiral of his victory at Trafalgar, Nelson, now certain of death sighed ‘Thank God I have done my duty’. 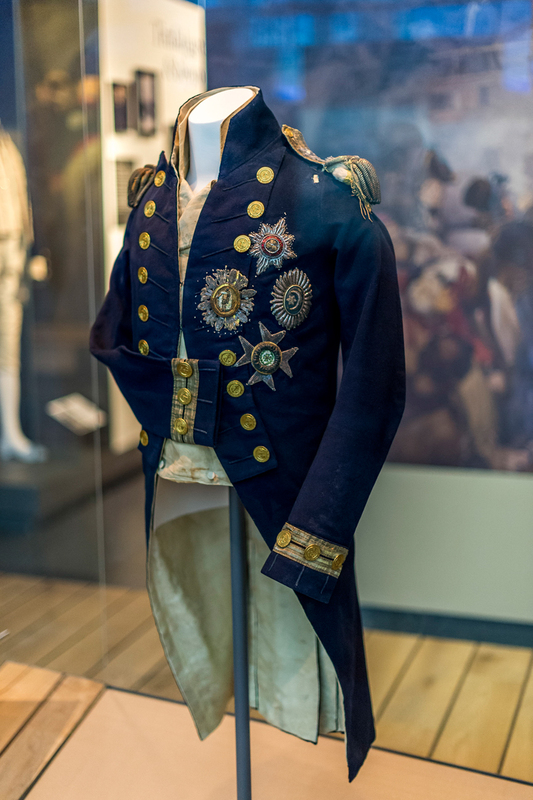 As a keen photographer, this was something I felt strongly compelled to capture and I was delighted with the final picture I achieved of Nelson’s jacket (see the bullet hole in the left shoulder), aware that museum photography is far from easy. A few things stood me in good stead however and this is my recommended approach in such places for those using a DSLR. First out, the light in museums is almost always terrible for high quality photography, usually a mix of sunlight, spotlights and fluorescents, with ample areas of darkness plus unwanted reflections to boot. Accordingly, leave your zooms at home, zoom lenses often have a widest aperture of f/3.5, or if you have a pro lens, f/2.8, but take your prime, and you can easily be at f/1.4, a full two stops of light improvement, which means that if you are at ISO 400 on your prime, it’s likely you would be at ISO 1,600 on your zoom at which point picture quality can significantly deteriorate. Shoot wide open, so that on an f/1.4 lens, that would of course be at f/1.4, and chance the lowest shutter speed you can get away with – on a 50mm lens, I would set the shutter to 1/60th of a second. With your aperture and shutter speed fixed (best to use Manual mode to do this), let your Auto-ISO adjust for the changing light conditions. And the really good news? The 50mm prime lens offers the best quality at the lowest price possible, a rare example of getting more than you pay for. With Nikon for example, the 50mm f/1.8 prime starts at £109 new! On eBay, you can get it even cheaper. The quality is the same as Nikon’s pro zoom lens 24-70mm f/2.8 (which is slower) yet retails at over £1,000. If you are feeling flush however, both Nikon’s prime 20mm and 28mm f/1.8 are absolutely superb and it’s worth remembering that in museums, there’s not a lot of space so little room to stand back from the subject, hence a wide angle is far better in this situation than any other lens in my view. 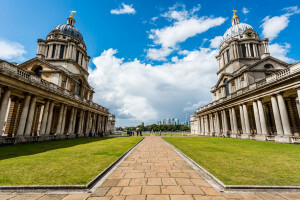 We leave the museum now but stick on the naval theme as we walk for just two minutes to the Old Royal Naval College (ORNC) which before that was the Royal Hospital for Seamen at Greenwich. 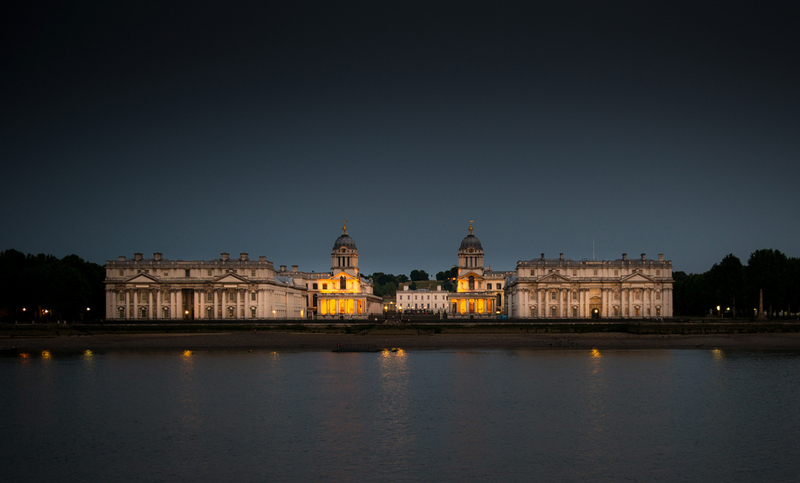 The site is divided into two so that the Queen’s House, originally built for Anne of Denmark, queen to King James I of England retained its unspoiled view of the River Thames. 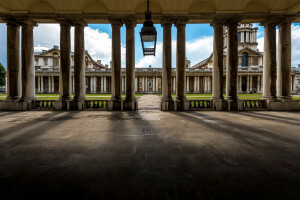 The site is without doubt a masterpiece and as a World Heritage Site is considered as being of “outstanding universal value, unsurprising perhaps given that its architects were Sir Christopher Wren and Nicholas Hawksmoor. 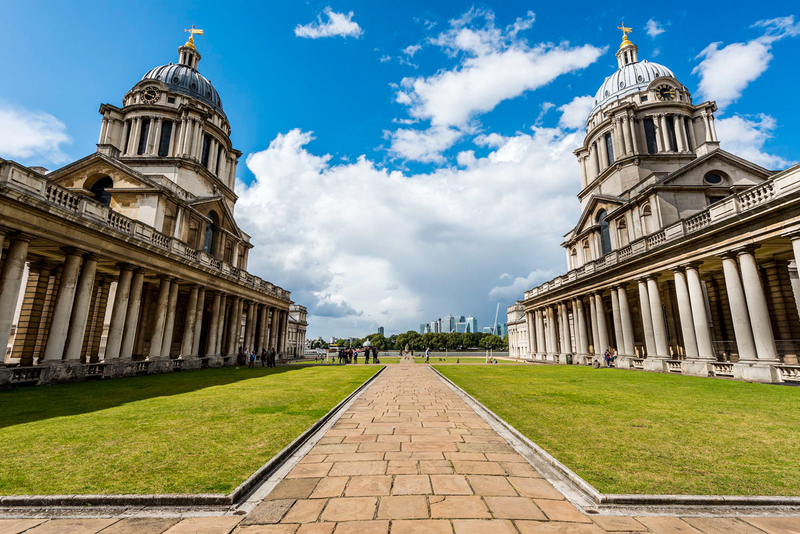 If you have time and care for a walk, perhaps the best view of the ORNC is offered from the Isle of Dogs a short trip through the Greenwich foot tunnel, itself worth seeing as a triumph of Victorian engineering. 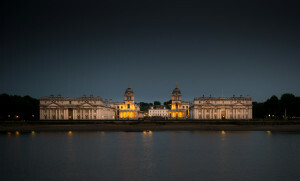 But wherever you are and whatever lens you have, from wide angles to zoom, the ORNC offers something for every photographer and it’s almost hard to leave Greenwich without a good picture given how generous the architecture is, though London weather may conspire against you if like me you always want a vibrant blue sky in your pictures. One thing that you must not do is leave Greenwich before visiting the Painted Hall, described as “the finest dining hall in Europe”. 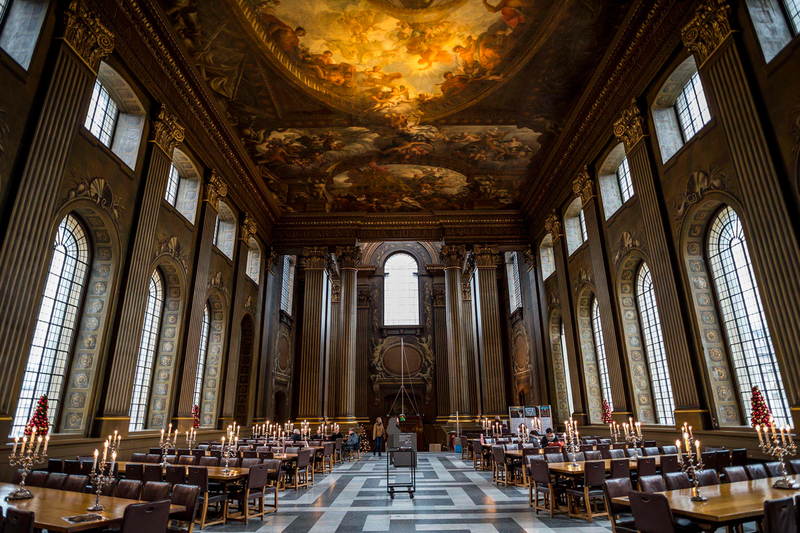 Once again at the Painted Hall, you are indoors so you’ll want a fast wide angle lens on your camera. The room is utterly breath-taking and I wonder if this is London’s best kept secret, free to enter yet the equal of any paid attraction. I can’t believe it took me so long to discover it; something this beautiful is truly food for the soul. 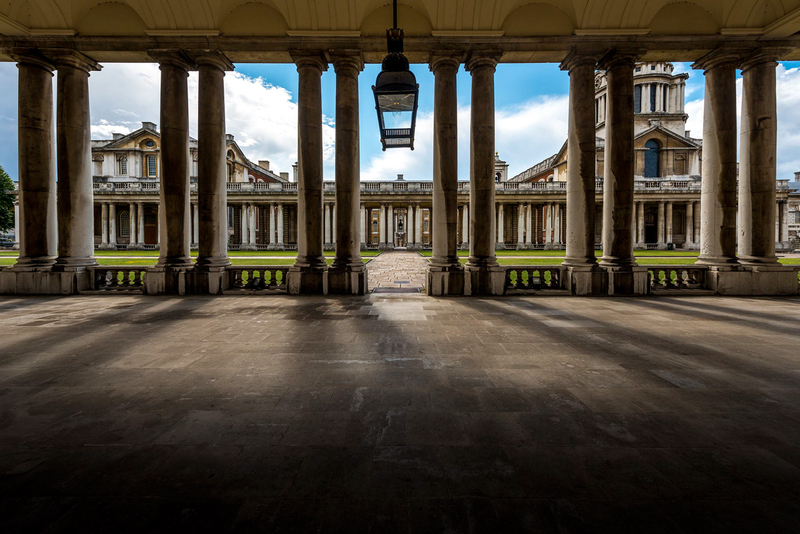 The chapel is directly opposite the Painted Hall and this too, built to the designs of Christopher Wren, should form part of your visit. 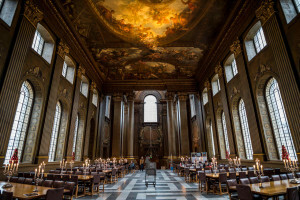 Of hidden gems however, ensure you walk in to the King William Court alongside the Painted Hall, something which I am sure many visitors just pass by. After you walk in, turn around, and view the classical style pediment that further celebrates Nelson, showing his body, surrounded by symbols of battles at sea, being delivered into the care of Britannia by a figure representing Victory. Here, your wide angle will allow the context of the surroundings, while a telephoto zoom can make the detail come alive. 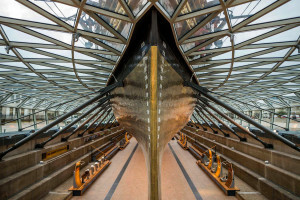 There’s so much to do in Greenwich that a blog post can only scratch the surface – as can but a day there – but I choose as my final stop the Cutty Sark which is now a permanent museum exhibit in Greenwich. 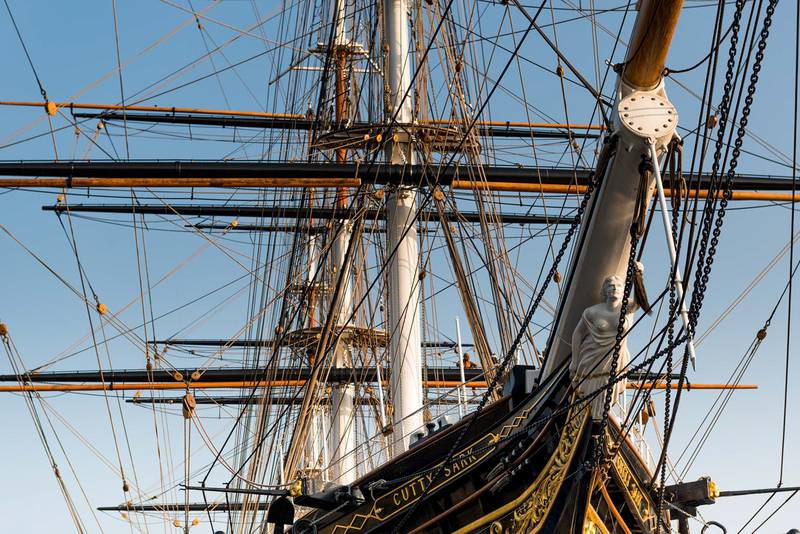 The Cutty Sark, built in 1869 was the fastest tea clipper of its time and evokes all the romance (and hardship) of life at sea in the age of sail. 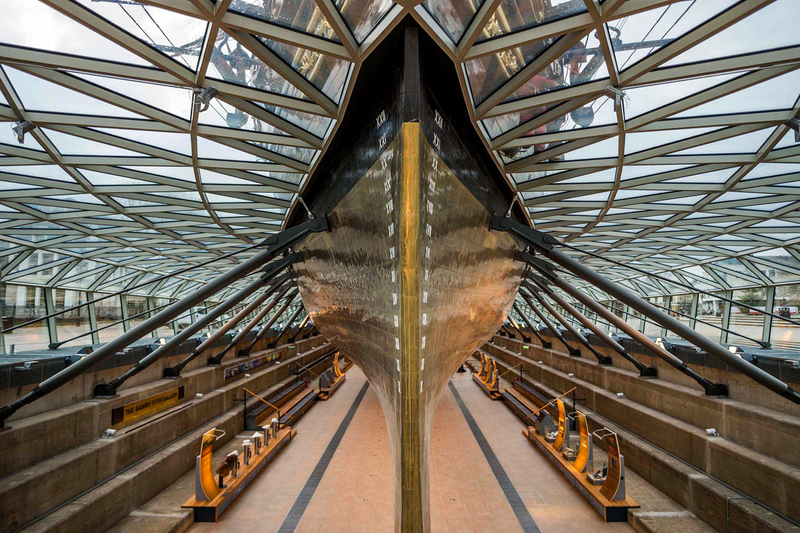 Following a fire in 2007, the ship was brilliantly restored and now sits on an elevated glass platform allowing every inch of the vessel to be explored. It’s an outstanding museum, educational, a joy to visit and a thrill for all ages. If after all this you have any energy left, walk to the park and up the hill which rewards you with spectacular views of not just Greenwich but everything from the Shard in the West, Canary Wharf directly ahead and the O2 in the East. Then perhaps treat yourself to a pint or two in one of the many local pubs to end a thoroughly fabulous day. 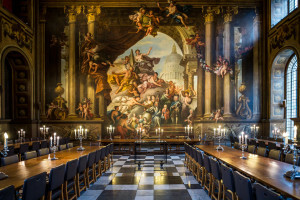 Will be visiting the Painted Hall for sure next time I’m in London with an hour to spare. You are a very gifted photographer, David, which I’ve been kind of aware of for some time via dipping in and out of Twitter. Here, they make a wonderful gallery indeed.